A chocolate cookie with chunks of semi-sweet chocolate and chopped walnuts - pure bliss for chocolate lovers! 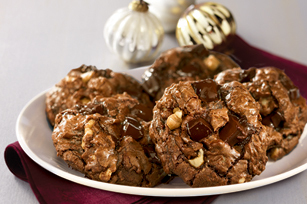 The name says it all in this chocolate cookie recipe. Chop 1 pkg. chocolate; set aside. Chop remaining chocolate; place in large microwaveable bowl. Microwave on MEDIUM 3 to 4 min. or until chocolate is almost melted; stir until completely melted. Add next 5 ingredients; mix well. Stir in chopped chocolate and nuts. Drop teaspoonfuls of dough into 36 mounds, 1 inch apart, on baking sheets. Bake 6 to 7 min. or until cookies spring back slightly when touched with finger. Cool 2 min. on baking sheets. Remove to wire racks; cool completely. Making cookies is a fun activity for the whole family. Enjoy a walk after baking the cookies.